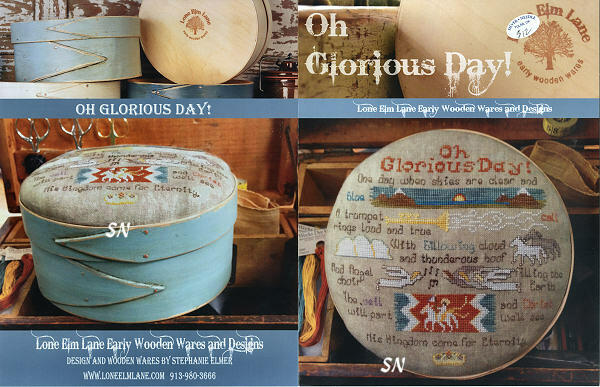 We present Lone Elm Lane Designs Early Wooden Wares and Designs -- Charming, traditional designs -- most that finish round to fit some very special hand-made boxes -- or rectangular to fit lovely cabinets or frames. The charts are all offered in leaflet format with different pictures of the finished project on both the front and back covers. 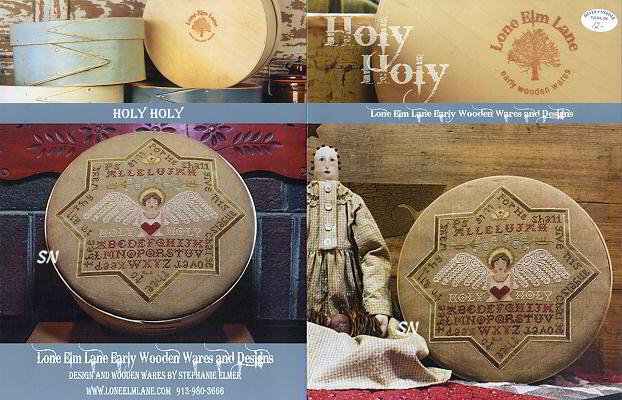 The featured boxes are Lone Elm's own handmade creations! VERY heavy and nicely done each box is hand-pieced and assembled... beautifully painted in one of four different colors and then distressed. The lids are 'reversible' in that they are recessed to fit different types of hand work. 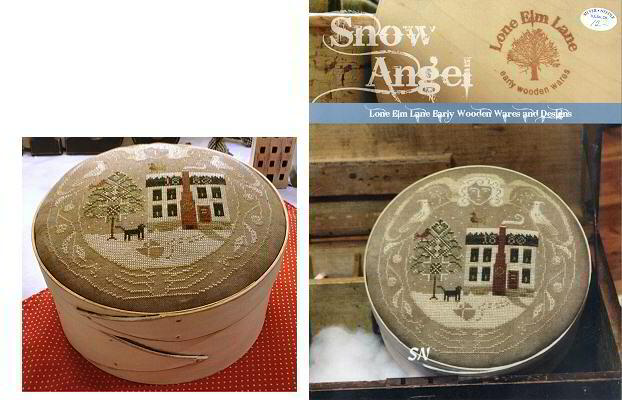 One of the sides is perfect for cross stitch or quilting... the other is deeper for hooked rugs. Currently the four box colors (some work for more than one design) are Wooly White, Aged Pewter, Robin's Egg and Black Iron. Boxes are offered in 6, 8 and 12-inch sizes. Tis a Melody is a set of three 50 x 60-ish designs - each finishing approx 3-1/2 x 4 on 30ct. You can see them finished into a pin cushion, scissor pouch and needle book... and then all tucked into compartments of a little wooden display drawer. (Hang that on the wall, or perch it on a shelf!) *In my heart there rings a melody... tis a melody of love. 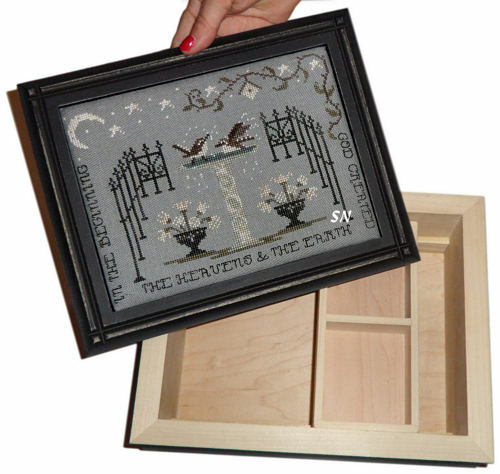 * Such a pretty set of designs... they are charming together, and the little drawer (you can find them at Hobby Lobby) is such a fun way to show them off. Stitched on 30ct Cocoa linen with hand-dyed flosses. 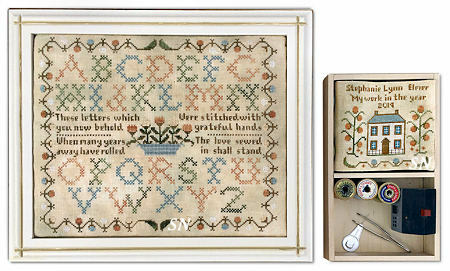 Grateful Hands - *These letters which you now behold, were stitched with grateful hands. When many years away have rolled, the love sewed in shall stand. * Stephanie stitched this on 36ct to fit the top of her 8 x 10 Crown Box. 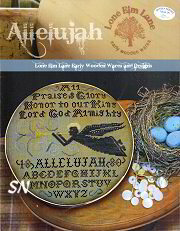 ($160 Special Order, several finishes available) There is a coordinating needlebook pattern as well... both are stitched with DMC 926, and hand-dyed flosses of Oilcloth, Dried Thyme, Cidermill Brown, Woodrose, Lambswool, Barrel Cactus and 12 Grain. The letters all look like they are Rice Stitches... but they are just regular crosses! VERY pretty! 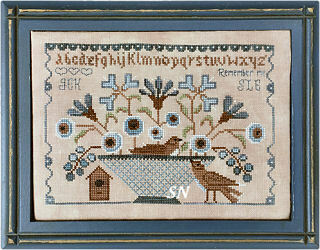 Little Brown Sparrows - A sweet little basket of flowers ... that bird found a prettier place than his little wooden house! 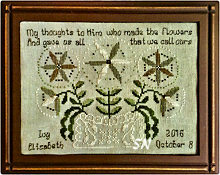 Stitched on 36ct, it finishes 5 x 7... Stephanie has it framed in the top of one of her boxes. A nice mixture of blues and brown, you'll use Blue Jay, Oatmeal, Raven, Dungarees, Maple Syrup, Freedom, Picnic Basket, Lemongrass and Blue Beadboard. 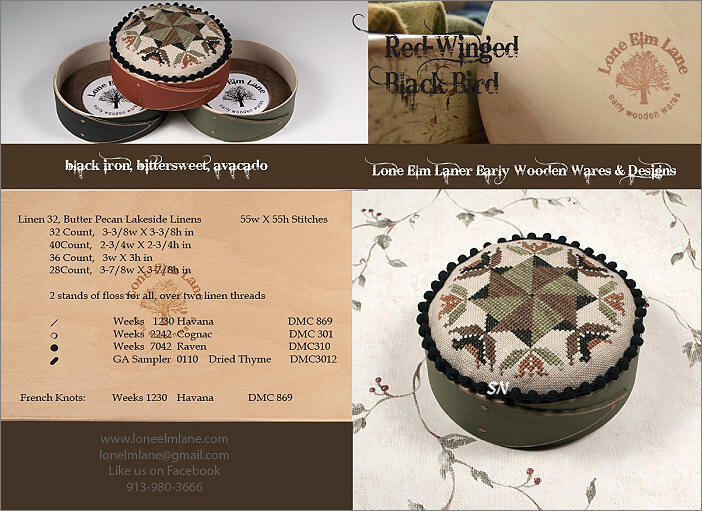 Lone Elm Lane has introduced empty rounds to house pin-cushions! Measuring 4 inches in diameter and approx 1-1/4 inches high, they are ready to house your puffy little 'hill' of needlework! Offered in 6 colors so far (My pic accidentally has two of the red in it, and not Bittersweet, which is a bit more on the golden rust side.) 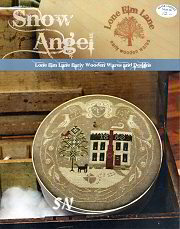 They are the same finish and quality as Stephanie's larger boxes. 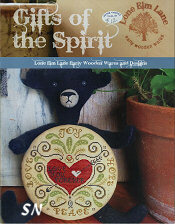 Also brand new are three leaflets with designs for her shaker boxes... take a peek! 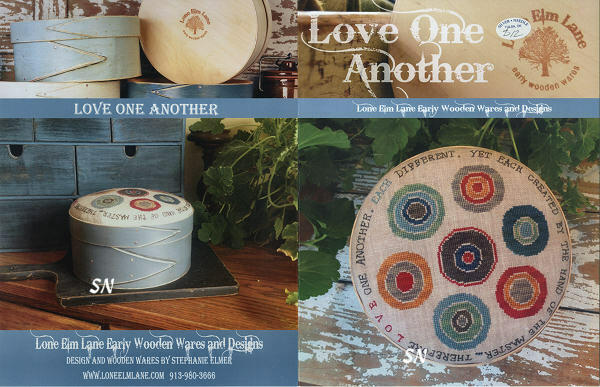 Lone Elm Lane Presents Hand Made Wooden Boxes to Compliment Their Designs! 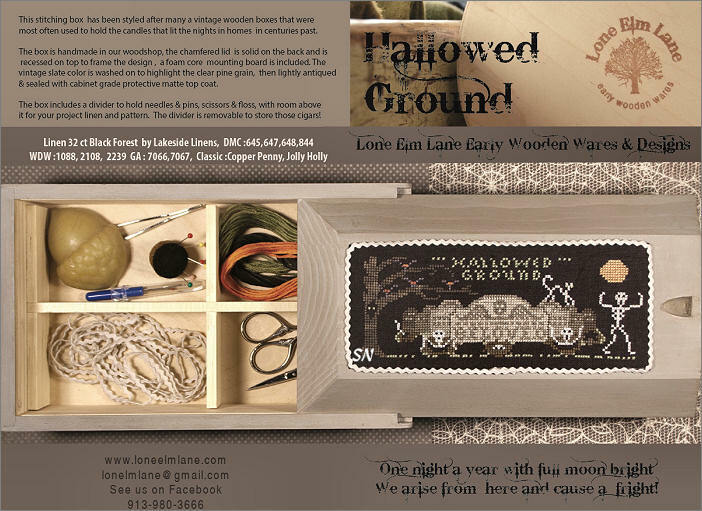 The featured boxes are Lone Elm's own handmade creations! 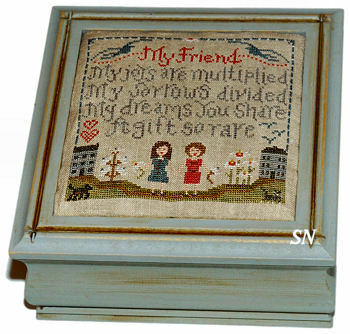 VERY heavy and nicely done, each box is hand-pieced and assembled... beautifully painted in one of four different colors and then distressed. The lids are 'reversible' in that they are recessed to fit different types of hand work. 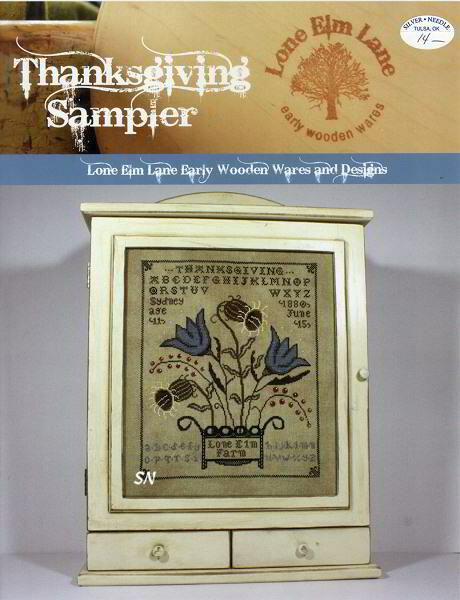 One of the sides is perfect for cross stitch or quilting... the other is deeper for hooked rugs. Currently the four box colors (some work for more than one design) are Wooly White, Aged Pewter, Robin's Egg, and Black Iron. Boxes are offered in 6, 8 and 12-inch sizes. 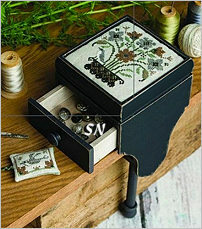 Sweet Fragrance -- Cute little needlecase stores inside the little drawer, the matching design fits the box front. BUT... you can always skip the box if need be and just stitch the design! 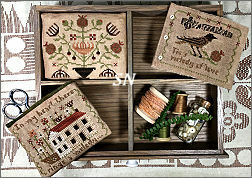 Hopes and Dreams Sampler -- *I plant my seeds of hopes and dreams then water them with prayers. * Coded for hand-dyed flosses. 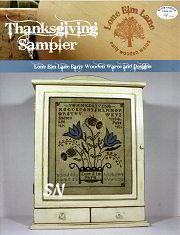 Fall Flowers is the small chart of a floral urn that fits into the top of this box. There is a matching small fob pattern included as well. 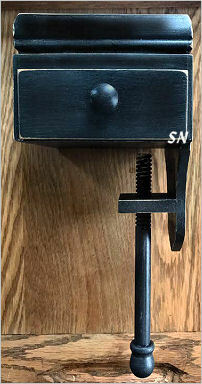 Black Iron Clamping Pin Box -- We already have this in "Wooly White' finish -- With Thy Needle has used it -- now here it is in Black Iron! 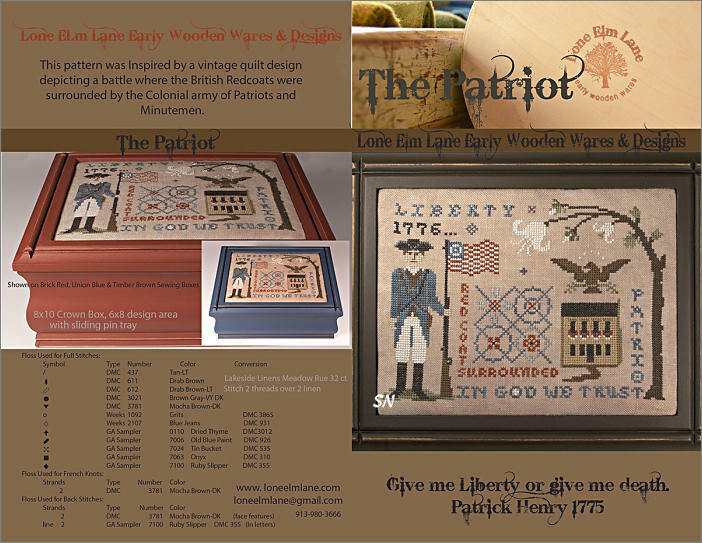 Lone Elm Lane's newest designs -- use them atop their boxes, or on your pillows and in frames! Presented as single charts, Stephanie has new charting software, and these are beautifully printed as full color charts. 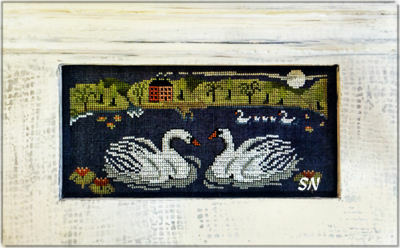 Swan Lake finishes approx 8 x 4 on 32ct Gunmetal Linen. LOVE the brilliant greens against the dark metal gray background. She says this pic is in the style of Rufus Porter -- a famous muralist all around the New England region between 1825 and 1845. 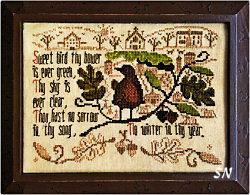 Ivy's Sampler finishes approx 5-1/2 x 7-1/2 on 32ct linen... hand-dyed flosses... I think this is a birth sampler! Sweet Bird -- In reading... this is one lucky bird! *Ever green, ever clear, no sorrow and no winter! * Hand-dyed flosses, this finishes approx 7-1/2 x 6. This is a fun design -- all red, aged green and black -- in that yummy 'ceramic' bowl! On 28ct linen, this finishes approx 6 x 8-1/2, and calls for Dried Thyme, Tin Bucket, Onyx, Ruby Slipper, Aged Pewter and Hickory Sticks hand-dyed flosses. 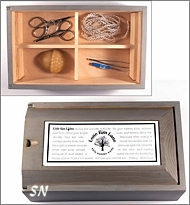 Presented in a leaflet, it is featured in one of Lone Elm Lane's newest box styles -- The Cabin Box -- which features a divided tray inside. 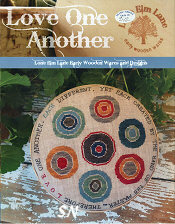 Lone Elm Lane has a cute new pin cushion pattern that finishes just under 3-1/2 inches in size. Just 6 colors of hand-dyeds on a bit of neutral 16 aida or 32ct linen...it's just a nice seasonal something to have in your growing bowl of stitched lovelys. 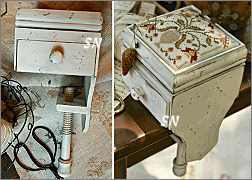 NOW... check out her new Sewing Clamp Box in the pic! That is a new finishing piece, patterned after antique clamp boxes. 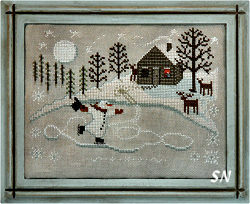 The top has a 1-inch deep recessed area to frame your needlework. It's really a petite 4 x 4 x 4 box -- complete with a little pulling out drawer (can you see the knob down there in the pic?) THEN, the whole thing clamps to the edge of a table with a cool screwing pole on the bottom -- SUPER CHARMING! 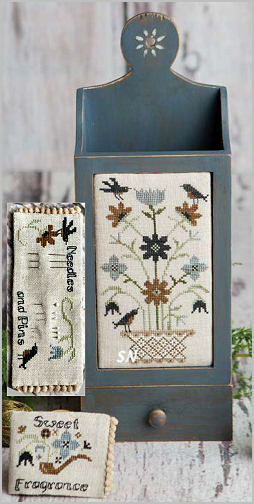 A charming new box featured on the cover of With Thy Needle's newest design... this little box is SO COOL! A concept by Brenda Gervais that Stephanie Elmer brought to be... this hand-made wooden box measures approx 4 x 4 x 3 with a clamping system that reaches down another 6 inches. 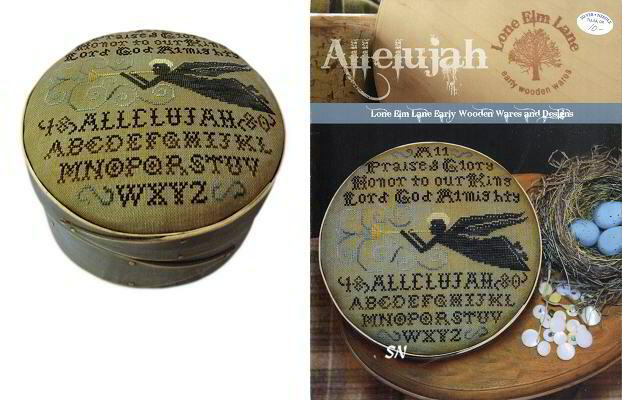 It features a 1-inch deep recessed opening for your needlework. Next, there is a little 3 x 3 square drawer approx 1-inch deep that pulls out, and finally, the bottom features a 6-inch screwing clamp attachment that can fit up to a 1-1/2 inch thick table edge! By far the coolest little box I have seen in a while... what an endearing decoration for your needlework! 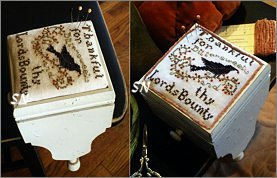 Currently offered in only the Vintage Dove finish... what a fun and unique way to finish and display a pretty pin cushion! If you are worried about damaging a table, consider a piece of felt underneath the box between it and your table, and a bitty piece underneath. You might want to clamp it out of reach of little hands -- this is the most intriguing thing -- and awfully fun to play with!!!!! 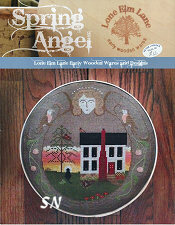 Several New Arrivals from Lone Elm Lane -- Here are three of the five new! 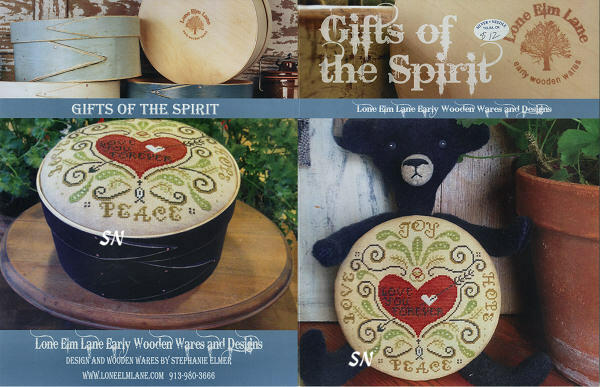 Primitive designs offered as small charts, Stephanie Elmer has lots of new offerings for her awesome line of handmade *Early Wooden Wares* boxes and pin cushions. 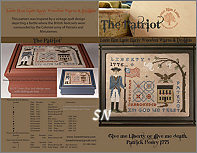 The Patriot -- Coded for DMC and hand-dyed flosses, this finishes approx 6 x 8 on 32ct linen. 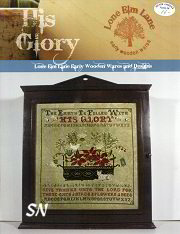 It can be finished any number of ways, but is shown mounted into the top of one of Lone Elm's 8 x 10 Crown boxes. 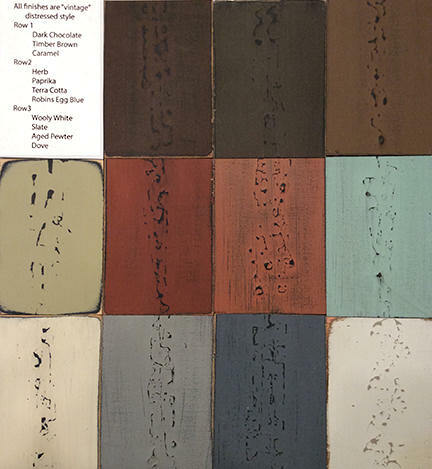 They suggest either Brick Red, Union Blue or Timber Brown. A pretty patriotic piece, I like all the elements -- the soldier, the quilt motifs and flag, eagle and house. There is a lot of charm in this! Red-Winged Blackbird -- This is a sweet pin cushion! 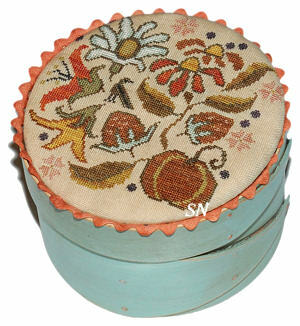 Lone Elm takes the tops from their round Shaker boxes and makes then in 4-inch miniature 'dishes' for needlework mounting to make pin cushions. This small design finishes only 3 x 3-ish and is shown in the Black Iron, Bittersweet or Avocado colorsNext, notice the baby-ball fringe trim on there????? 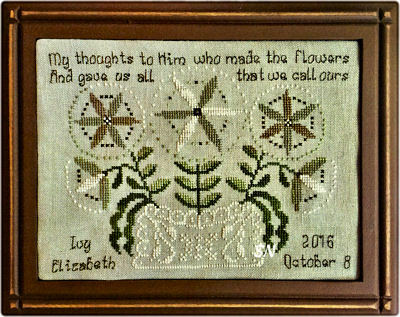 We have lovely trims by both Dames of the Needle and Lady Dot that will transform your little cushion into a perfectly mounted work of art! 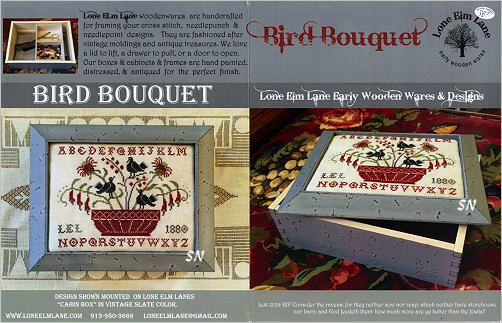 Wow... this is a new style of box --handmade in Lone Elm Lane's woodshop -- that has several charming features to it. Inspired by antique candle boxes that held cigars and documents, it measures approx 10 x 6 x 4 in size, features a chamfered -- a slide-off lid -- with a recess opening for needlework, and a divider inside to give you 4 small compartments. Stitch one of the Halloween pieces for this or Love Birds. Offered in Vintage Slate, it is a finish that is washed on to highlight the clear pine grain, then lightly antiqued and sealed with cabinet grade protective matte top coat. A pretty clay pot filled with simple blossoms, look at how the alphabet begins at the base of the pot and travels clockwise... but is always right-side-up! Choose either a round or square box for this... offered in leaflet format. Call us if you'd like to consult about a round or square box for this! This is real cute when it's stitched. The photo on the leaflet cover is very yellow... I am hoping we can correct that coloration in our picture for you. The grays, teals, browns and winter whites in here are soft and restful together... choose a rectangular box... or pretty gray mat. Finishes approx 5 x 7 on 28ct. This is an elegant study of grays, cream and black. Stitched on a dark gray linen, there are actually 10 different colors in this, but my eye sees about three! Shown inside the top of Lone Elm Lane's 8 x 10 rectangular Crown Box in the Antiqued Black Iron finish... consider a distressed charcoal black frame for this as well. Well, this is an eye-catching box-top! By Lone Elm's Stephanie, we have a very haunted house, complete with crumbling roof and overgrown landscaping. Choose any mangy darker 32 or 36ct linen to make this fit into the top of one of Lone Elm's Black Shaker Boxes. There is an invasive vine traveling everywhere, and even an empty grave!!! I personally love the little skeleton dog!!! Anyway, charted for Weeks and DMC flosses, it's just a really fun design with some unique elements! 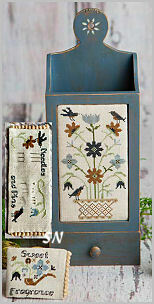 Offered as the leaflet, we also have these luscious boxes -- which are a design favorite of Blackbird and Shepherd's Bush! 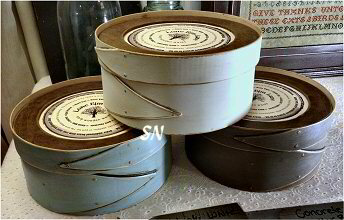 A Vintage Slate light blue-ish grey finish has been painted onto Lone Elm's hardwood, hand-made box. They have used an antique moulding style, cut it and constructed each box, applied their distressed *Vintage and Velvet* finish, sanded everything till it's butter-smooth... and even added a divided tool tray into this style! Stephanie has a leaflet design -- True Friends -- that fits the top of the box... but since the recessed opening in the lid is 1/4 an inch deep and 6 inches square... I imagine you may also have something really special already in your stash to fit this!!! It sounds really dumb... but this box SMELLS WONDERFUL inside! Such a clean, fresh, yummy wood flavor... I think it just adds to the charm, and lets me know that this didn't come off a 'slow boat from China!' It's handmade! Other designers are featuring Lone Elm Boxes, too! Anyway, this is mounted into the top of a Robin's Egg Blue box -- but Lone Elm has a burnt red colored box that would be KILLER for the colors in this piece. (Changing the light rik-rak trim to a darker color as well would be a personal choice of mine!) Anyway, a pretty design, very traditional and primitive... it is coded for DMC or Weeks overdyed flosses. Talk to us about color choices on these boxes! 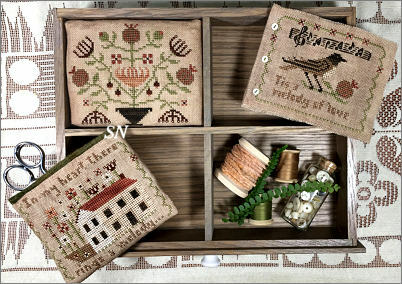 This is a delightful set of designs to grace the top of a wooden box, a round pin cushion, needle book, scissor fob and treasure tray lid. You might recognize Lone Elm Lane's 8 x 8 Queen's Crown Box. 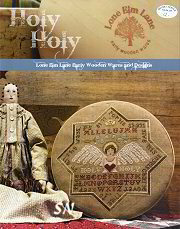 Offered as the chart -- I bought ALL THE WOODEN PIECES AND FLOWER PINS that you need for all of this. Simona has charts for all the sunflower designs that scatter all over each piece and she includes 29 actual photos of her finishing and assembly for you in her instructions. Everything is worked on Weeks Dye Work's 32ct Beige hand-dyed linen with 8 shades of Weeks hand-dyed flosses in Ivy, Grits, Whiskey, Sea Foam, Charcoal, Pelican Grey, Baked Apple and Pink Sand. Along with the 7 x 7 main sampler piece, the pin cushion is a little drum topped with a bit of Week's Lancaster Red hand-dyed wool. Can you see the yellow clay sunflower pins stuck in it? You get those in here. 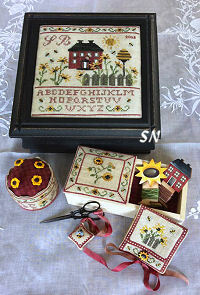 The needlebook features a wooden sunflower button closure and wooden bee buttons that embellish. (you get those wood buttons.) 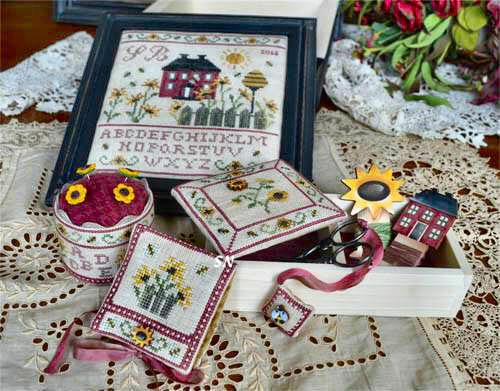 There is a wooden sunflower needle minder inside -- that you cannot see in the pic, and you get those two wooden thread winder bobbins -- the sunflower and little red cottage. 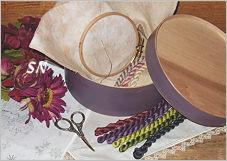 The wooden tray you see with the bobbin winders perched in it comes inside the Queen's Crown Box. (Note... the box is pricey. We'd love to sell you one, but I imagine you might be able to find something good for this at a big box store and save a little money! That is totally up to you!) 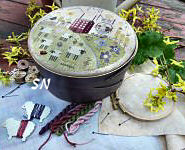 The chart comes with the pins, wood buttons, sunflower needle minder and pair of wooden thread bobbins. 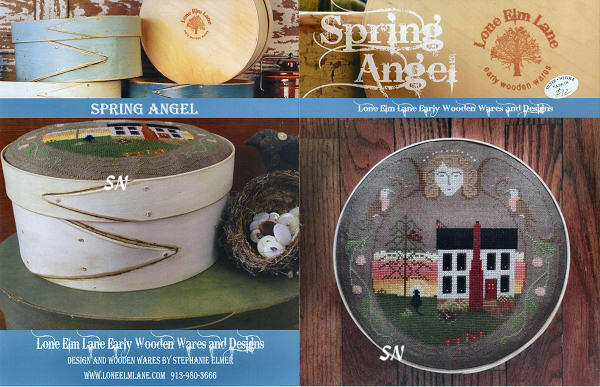 Lone Elm has 4 new leaflets with a bit brighter color than her first set of designs. 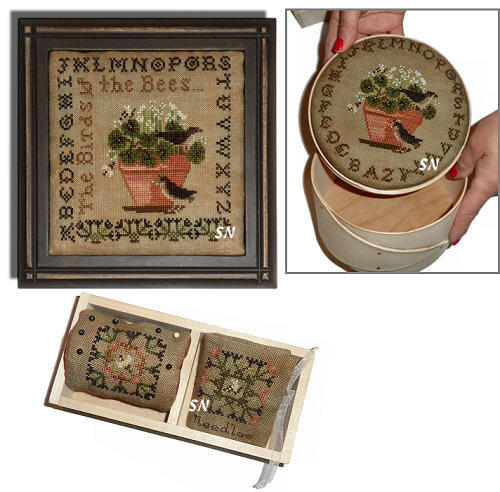 Stitched on various counts of fabric, all four are shown mounted in the tops her 8-inch wooden Shaker boxes. Stitched on various counts of hand-dyed fabrics -- if you choose not to finish onto the box-tops -- you can choose any other counts you want! 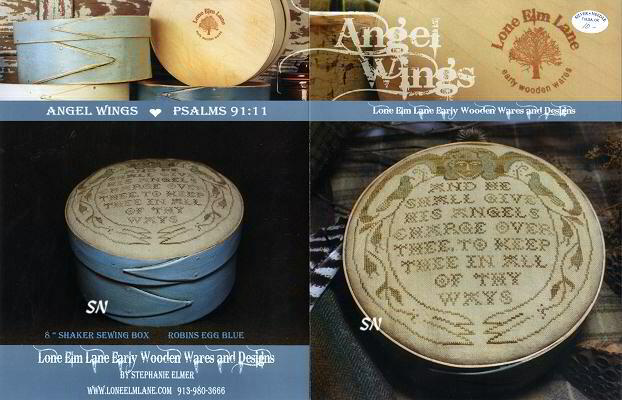 Because the design is circular, the verse just goes round and round the box top! 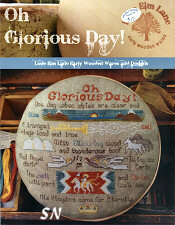 All four new designs are offered in individual leaflets. 128 Stitches round, this finishes approx 7- 1/8 inches round on 36ct linen. 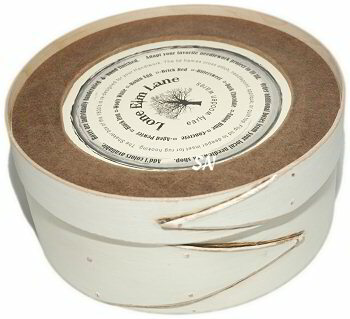 It fits into the top of an 8-inch hand-made Shaker Box by Lone Elm. Coded for DMC or Gentle Art flosses, it's such a pretty design. The angel all around reminds me of a snow globe. Offered as a leaflet. Stitched in both Weeks and Gentle Art hand-dyeds of whites, caramels and deep cranberry, can you see the color shading in the triangular border? That is done with two different hand-dyed colors to give it all that depth! Such a neat shape, gorgeous colors, very pretty for pillow, wall hanging... or of course, a box top! Offered as a leaflet. 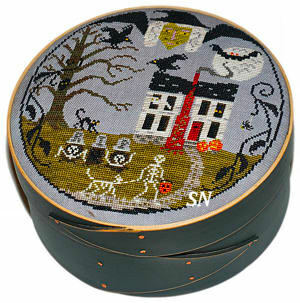 This finishes approx 7-1/8 inches round on 36ct linen. It is worked in only two overdyeds -- Gentle Art's Burlap and Lexington Green -- it'll be stunning of several of Stephanie's boxes. Just a pretty floral piece, personalize it with your family name on the pot near the bottom. 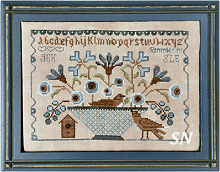 On 32ct Copper Penny Linen, this finishes approx 10-1/2 x 12-3/8 inches. 11 Different shades of DMC and overdyeds. 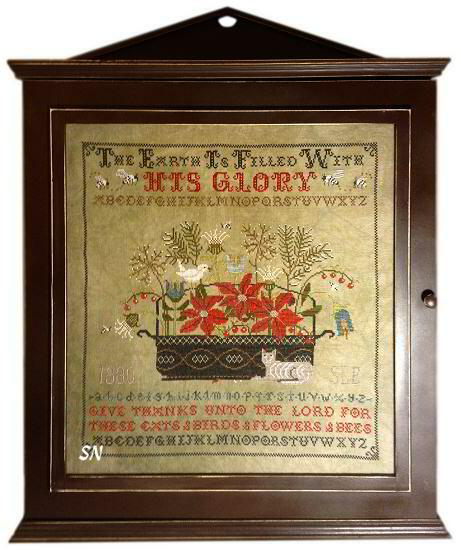 It is shown in Lone Elm's *Linen* cabinet -- a definite investment! *The Earth is filled with His Glory. Give thanks unto the Lord for these cats & birds & flowers & bees. * Make this a Christmas-feeling piece by following the color recommendations, or change the Cayenne thread color to Cadet in the wording. A very simple design with really simple color application -- this is lovely! 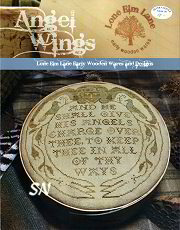 Stitched on 32ct Copper Penny in Weeks and Gentle Art hand-dyeds, this finishes approx 7-3/8 inches round. The featured box is the 8-inch Wooly White. There is a lot of variation on the hand-dyed colors -- Stephanie is using more than one color of the blue, for instance, to achieve that look. Very Pretty, offered as a leaflet.